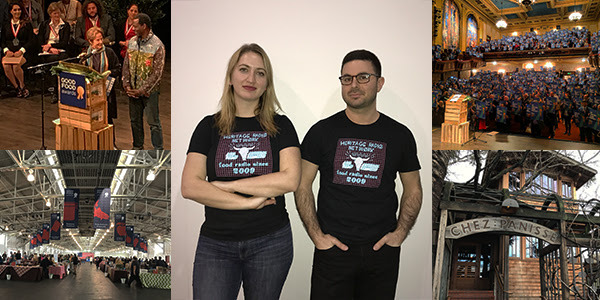 In the midst of political upheaval and protest, our Executive Director Caity Moseman Wadler and Lead Engineer David Tatasciore packed their bags and headed to San Francisco to shine a light on the good food movement at the 2017 Good Food Awards. The awards honor producers who create food that is delicious, socially conscious, and environmentally responsible; producers who know that who know that good food must be all three. Caity and David spent time learning from innovative producers and inspiring thought leaders at the awards. Tune in for Caity’s interview with Alice Waters and Cal Peternell over lunch at Chez Panisse. Check out clips from the Awards Ceremony to hear inspiring speeches, from environmentalist Winona LaDuke to founder of Good Food Awards, Sarah Weiner. And listen to the incredible stories of the nominees and winners themselves from the floor of the Good Food Mercantile. Episodes 7-28 of Heritage Radio Network On Tour cover this year’s awards. We’re so excited to share these pieces with you. Episode | Nashville takes over HRN!